The problem with most big summer blockbusters is that they usually trade plot holes for bigger and better explosions. It's sort of like a magician and sleight of hand. The filmmakers hope that you don't spend too much time thinking about the plot and more time going "ooh" and "aah" at the pretty pyrotechnics. 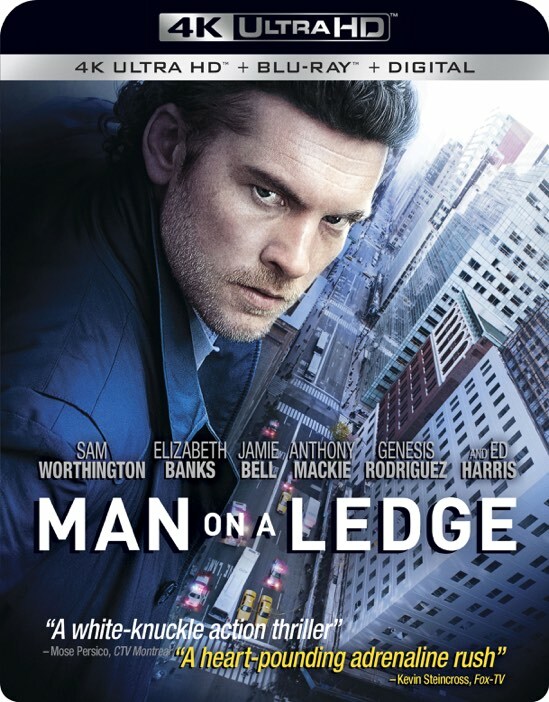 Thankfully, Man on a Ledge was released in theaters in January (of 2012) where films go to find a quick death. And yet, much like its more marketed summer releases, Man on a Ledge is an enjoyable popcorn film as long as you don't take too much time to dissect its rather glaring shortcomings. But, this review isn't going to be a discourse into better plotting for big action movies. No, this is a 4K UHD review of a film that I vaguely remember enjoying more than I expected to seven whole years ago. Of course, a lot has changed for me personally in the intervening years, namely becoming a father twice over, so I was anxious to see if the film still holds up for me, or if I had already become more of a hardened cynic in such a short time. I'm pleased to report that not only does the film continue to entertain, but the intervening years have only allowed me to accept the film's blemishes more easily and I came away with an even more positive impression of the film. The film doesn't stray too far from its simple title as an escaped prisoner spends most of his time on a ledge high above New York City in a desperate, last-ditch effort to prove his innocence. Naturally, more is going on than meets the eye and Man on a Ledge ends up being a fun cat-and-mouse journey with plenty of twists along the way. While Sam Worthington is the titular character in the film, the real scene-stealer for me is Elizabeth Banks as the hardened negotiator dealing with her own baggage. Naturally, I had seen her in many other roles before Man on a Ledge, but her performance in this was the one that truly spoke to me. It was a revelation and demonstrated to me that she was more than capable of carrying her own film. Over the last seven years, Elizabeth has continued to demonstrate her immense talents in all sorts of roles, both in front of and behind the camera. She is an incredibly gifted actress and director and I look forward to what the future holds for her. And yet, I can't help but wonder if she'll come back to these types of thriller films because she provides wonderful acting chops to go along with perfect comic timing that is crucial in defusing the tension that these movies tend to generate. On the 4K UHD, the Dolby Vision transfer offers several enhancements over the Blu-ray version. While the majority of the film plays out across the vivid landscape of Manhattan, there are other, darker sequences in the flashback sequences in jail and the heist scenes that are richer and less cluttered on the Dolby Vision track. The HDR provides more subtlely in the heavy blue and orange color palette that the filmmakers chose for the film. Also, there does seem to be a noticeable reduction in noise and grain in several scenes that is always a concern when making a transfer from a film negative. For whatever reason, the 1080p video transfer on the Blu-ray was a bit muddled in places. I always assumed that this was a deliberate choice by the filmmakers to give the film a grittier ambiance more akin to the action films of the 1970s. But with the clearer picture on the Dolby Vision transfer here, it's more likely that the original Blu-ray transfer was rushed and dumped onto the home entertainment market without much thought about cleaning up the print. Another solid bump to the film is gained from the Dolby Atmos audio track on the 4K UHD. I always felt that the ambient noise from Manhattan was rather subdued on the original audio track on the Blu-ray and the added channels of the Dolby Atmos track helps to correct this a bit. I still feel that the crazy cacophony of noise that is New York City is given the short straw, but it is an improvement over the existing 5.1 DTS-HD audio track. I just feel that any film set in New York should let the sounds of the city become its own character in itself. This would have been especially beneficial for a film such as Man on a Ledge where the distortion from below could even ratchet up the tension even more. Alas, it's a lost opportunity, but one that they try to correct nonetheless. Overall, the Dolby Atmos audio track does give the film a new living heartbeat that is missing from the Blu-ray version. The action scenes during the heist are taken to a new level and the overall tension of the film is much greater. The real downer here is that there were no new special features packaged with the 4K UHD Blu-ray. While certain cinephiles like myself are eager to replace movies in their collection with the latest and greatest technology, it's an easier sell to the average film fan when there are new features to ease the added cost. The same two bonus features, a featurette and an odd trailer with commentary from Elizabeth Banks, that were on the original Blu-ray are simply repackaged here on the 4K UHD Blu-ray. While it is a bit of a bummer, I would still recommend making the upgrade, especially if you are a big Elizabeth Banks fan as she is amazing in this and the 4K UHD does nothing to dissuade me of this belief. Man on a Ledge is now available on 4K UHD Blu-ray.